Should Target Put ‘Alex’ in an Actual Ad Campaign? Should Target put "Alex"—the Frisco, Texas, kid getting a lot of Twitter love because of his Bieberish mug and the pure randomness of the Internet—in an actual ad campaign? "Why not?" answered Will McInnes, CMO of Brandwatch. "Social media is a powerful and direct avenue to consumers. Given the velocity and reach of the #AlexFromTarget hashtag, there are a number of marketing and ad campaigns that Target could execute, for example: store appearances by Alex or Alex’s picks for clothing and seasonal items. They could even use Alex to showcase Target's corporate culture." Scott Deming, a branding expert, said, "It really depends on how they position it. If they hire him purely out of response to the online frenzy, they'll be viewed as reactive and pandering to their customers. If they hire him [for ads] and say, 'We're more than just a pretty face,' and position it as looking at people as valuable, beyond their looks, then that could work." Alex is still in high school, and his full identity has been appropriately protected. At the same time, he has bowled over the social media world in the last couple of days thanks to a photo of him working at the big-box retailer. He has accrued more than 400,000 followers and was a national trending topic on Twitter throughout Monday. Target acknowledged the phenomenon with a tweet today, and it quickly garnered tens of thousands of retweets and favorites. According to Brandwatch's research, there have been more than 46,000 mentions of #AlexFromTarget in the last day. And if Target wants to boost brand loyalty with tween girls, Alex appears to be the perferct spokesperson: Brandwatch said the gender split is heavily on the female side—67 percent to 33 percent—for the aforementioned hashtag. And when it comes to #AskAlexaQuestion, the activity is 74 percent female. Though McInnes suggested all parties proceed cautiously. "The notoriety of social media fame can have a dark side," he explained. "If Target moves forward with doing some kind of social campaign, it could be like a shotgun wedding. Alex could gain attention he doesn't want, and everything he does on social and in his life will be scrutinized. This could backfire for both Alex and Target." Matt Norcia, Brand Union's executive director, recommended that Target "react with humor and humanity. Go with the flow and embrace what your fans embrace. That is the essence of social." Indeed, the number of free impressions Target garnered is unknown, but the brand is at least temporarily the envy of the retail marketing world because of all the buzz. Meanwhile, Target is tight-lipped about whether #AlexFromTarget will have a second act in the form of an ad campaign. The Minneapolis-based company, like everyone else on the Internet, is probably just trying to make sense out of the development. "Usually our new weekly ad is what gets people tweeting on Sundays," a rep said in an e-mail. "So imagine our surprise yesterday when one of our Target team members managed to flood the Internet with images of red and khaki without even trying. 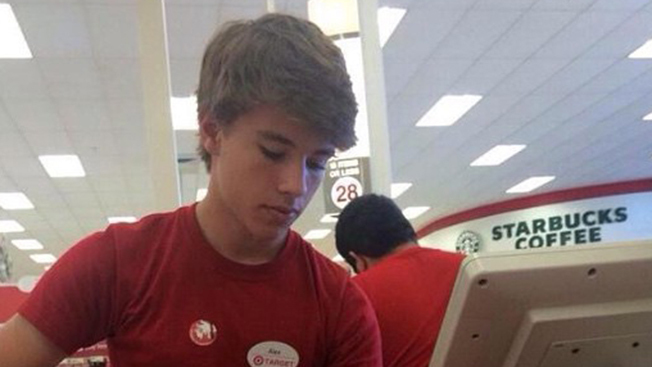 We are proud to have a great team, including #AlexFromTarget, and are in contact with his store and family. We will keep you posted if he is available for comment, but for now, we would ask you to respect his privacy."